What do you think heaven is like? I like my mom’s answer the best, “I can picture thousands of choirs singing in every language.” Wouldn’t it be great to be a member of that choir, being able to sing praises in every tongue and language since the beginning of time? 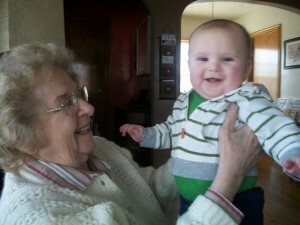 My grandma is the newest recruit, and how she loved to sing on earth! I bet she’s the loudest one up front. Just 3 days before she died, Wes and I joined my parents in visiting both of my mom’s parents. I’ve always bragged about their independence; they’ve lived in a condo in an assisted living complex for over 10 years. But just before Christmas, Grandma developed a blood infection and cellosis and was in the hospital for a little over a week before beating that and spending the next couple weeks in a rehab facility. While she was in rehab, Grandpa had a strange episode of weakness and slight confusion (we now think it could have been the flu or an infection. His MRI was normal.) and ended up in his own main-building room for a few days. 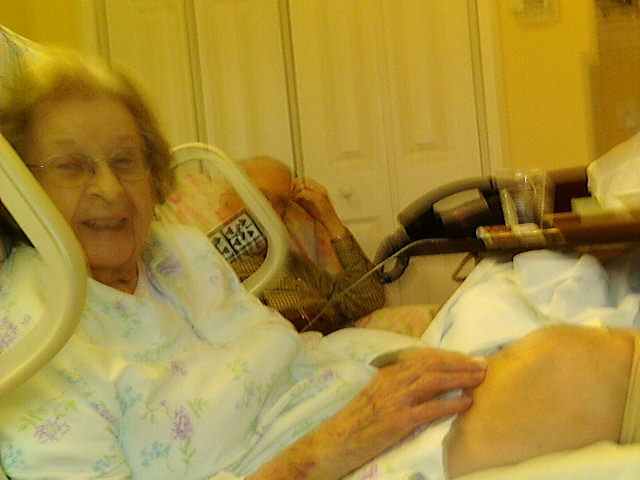 We had visited while Grandma was in the hospital, but we knew we should see them again now that they were both unstable. Saturday’s visit was great fun. The rain wouldn’t let up, but we brought games, movies and, of course, Wes’ camera. We exchanged belated Christmas gifts, laughed and were positive about Grandma’s recovery. She was anticipating her discharge date. And then it all changed. In the next 48 hours, she developed the flu, pneumonia in both lungs and her kidneys began to fail. She went to be with Jesus at 10:31 a.m. on January 6, 2015. I lost my paternal grandparents while in high school and college, and still grieve for them today. But I only vaguely remember my pain and mourning at the time of their passings. I must have blocked it out of my memory, perhaps like parents “forget” the pain of childbirth and pregnancy after it’s all done. Losing Grandma has been much more painful than I expected. The funeral was lovely; my sister and cousins spoke at her service, we led a congregational singing of How Great Thou Art – which was the most beautiful rendition I have ever heard – and we finally realized why it was so difficult to absorb her death. Grandma & Grandpa were all of our (there’s 10 of us first cousins) only living grandparents. And we have been very blessed to know them all of our 30+ years, and well. They loved our kids, too, and were very active in our lives. Grandpa is our last living grandparent; it’s hard to imagine a life without grandparents. It’s been two weeks since Grandma’s funeral. Life is beginning to normalize again, but she is missed. My mom and her siblings still have a few loose ends to tie with Grandpa’s move into a facility apartment, and we will eventually need to sort through furniture and items. Grandpa seems to be alright, but it’s a major adjustment. I’ve been overwhelmed with the amount of support and sympathy from family and friends through cards, flowers and emails. My mom and cousins have said similar things – it’s wonderful to know how loved Grandma was and is and how generous and kind our network of support has been. Grandma, sing loud in heaven! I’ll see you again one day. RICHMOND, Ind. – Maxine V. Ashbaugh, age 86, of Richmond, died Tuesday, January 6, 2015, at Reid Hospital. Born May 17, 1928, in Darke County, Ohio, to Melvin and Hannah Deaton Rust, Maxine was a 1946 graduate of Gratis High School in Gratis, Ohio. She attended Manchester College. Maxine lived in Richmond since 1949. She was a receptionist for Delynn W. Stults, D.D.S. for ten years, a teacher for two years in Lewisburg, Ohio, and a teacher’s aide at Holy Family Catholic School for four years. Maxine was a charter member of the Northside Church of Christ, where she taught Sunday School, held several offices at the church, sang in the choir, and sang solos. She was a member of Gingham Gals Home Economics. Maxine enjoyed spending time with her family. Survivors include her husband of 65 years, Donald Floyd Ashbaugh, to whom she was married on August 27, 1949; children, Jenny (Ron) Fernsler of Indianapolis, Indiana, Keith E. (Dee) Ashbaugh of Franklin, Ohio, David (Patty) Ashbaugh of New Whiteland, Indiana, and Julie (Michael) Chitwood of Franklin, Indiana; ten grandchildren; eight great-grandchildren; sisters, Louise Blickenstaff of Greenville, Ohio, and Margaret Ann Justice of Lebanon, Ohio; nieces; nephews; cousins; and many friends. She was preceded in death by her parents; sisters, Geneve Rust and Fern Brestel Carter; and brothers, Rev. Glenn C. Rust and Dr. Cecil F. Rust. 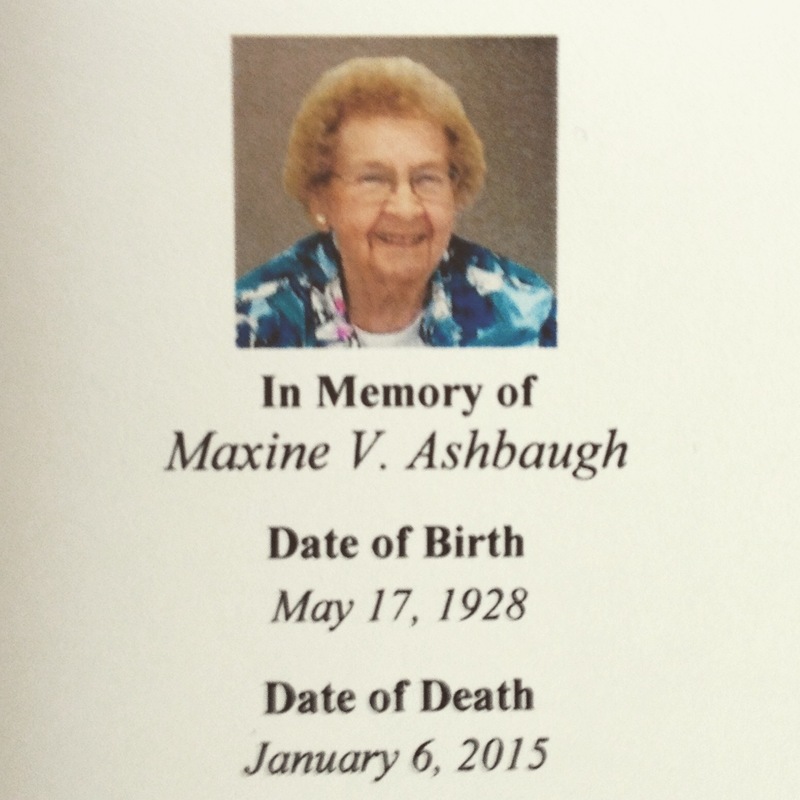 Visitation for Maxine V. Ashbaugh will be from 4 to 7:00 p.m. Friday, January 9, 2015, at Doan & Mills Funeral Home, 790 National Road West, Richmond. Funeral service will be at 11:00 a.m. Saturday, January 10, 2015, at Doan & Mills Funeral Home with Pastor Christian Penrod officiating. Burial will be in Crown Hill Cemetery. Memorial contributions may be made to: Northside Church of Christ, 1962 Chester Boulevard, Richmond, IN 47374 or Riley Children’s Foundation, Attn: Gift Processing, 30 South Meridian Street, Suite 200, Indianapolis, IN 46204-3509. Condolences may be sent to the family via the guest book at www.doanmillsfuneralhome.com.